Jack Schlossberg, grandson of President Kennedy, presents the Profile in Courage Award to former Congressman Bob Inglis. Former US representative Bob Inglis was given the John F. Kennedy Profile in Courage Award on Sunday for putting his career on the line to call attention to the threat from climate change. 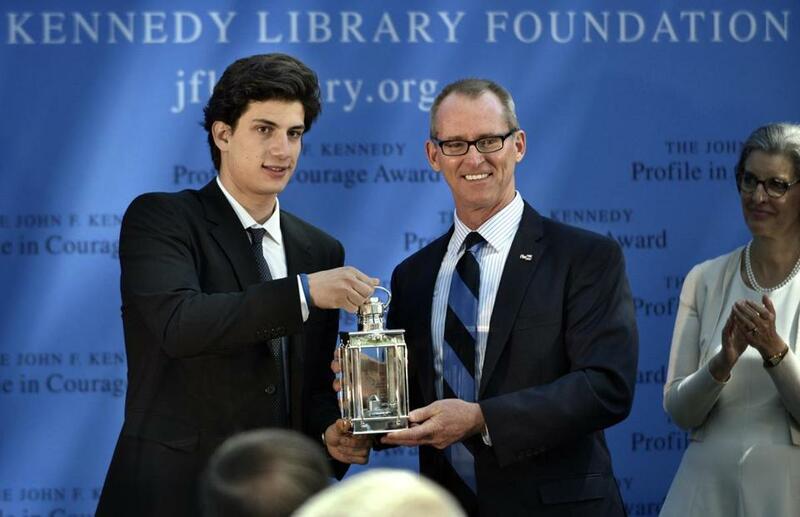 “My grandfather’s legacy is kept alive by Bob’s courageous decision to sacrifice his political career to demand action on the issue that will shape life on earth for generations to come,” Kennedy’s grandson Jack Schlossberg said in a speech at the JFK Library on the 25th anniversary of the awards. Inglis represented the Fourth Congressional District of South Carolina as a Republican from 1993 to 1998 and again from 2005 to 2010. He was honored for acknowledging that climate change is real and caused by humans, a decision he said played a role in his reelection loss in 2010. After being introduced by Schlossberg, Inglis described how the future of his children and interactions with scientists in Antarctica influenced his decision to recognize the threat to the environment. He said the free enterprise system can contribute to solving the problem by aiding government in putting a price on carbon emissions. The crowd of 150, which included former US senator Paul G. Kirk, Democrat of Massachusetts, applauded as both Schlossberg and Inglis honored the former president in their speeches. Inglis compared the challenge of climate change to Kennedy’s determination to reach the moon by the end of the 1960s. The Profile in Courage Award is given to a public servant who has made courageous decisions of conscience without regard for the personal or professional consequences. Inglis said in his speech that he did not think he could live up to previous recipients of the award, specifically Representative John Lewis, a Democrat of Georgia who was beaten by police during a civil rights march in Selma, Ala., in 1965. Other recipients of the award include former president George H. W. Bush, former congresswoman Gabrielle Giffords, and the late Senator Edward M. Kennedy. JFK Library chairman Kenneth Feinberg said the event was another example of success for the institution. “It’s very uplifting every year,” Feinberg said. “Just when you’re wondering if there will be a change in the attitudes, in exhibiting courage, in making tough decisions, along comes the annual Profile in Courage awards. When the ceremony ended around noon, Inglis stared outside the window of the JFK Library and said he visualized Kennedy enjoying the environment he has dedicated his career to protecting. Zolan Kanno-Youngs can be reached at zolan.kanno-youngs@globe.com. Follow him on Twitter @KannoYoungs.